Western NSW Primary Health Network (WNSW PHN) is committed towards the development of culturally safe models of care. The Cultural Safety Framework provides information and a comprehensive self-assessment evaluation tool to enable primary health care service providers to progress towards achieving cultural safety. Cultural safety in healthcare means designing and providing services that meet the needs of patients through a process of self-reflection, awareness of cultural biases and processes to actively respond in a way that will benefit the patient’s health and wellbeing. WNSW PHN plays a leadership role in the development of culturally safe models of care to ensure access to quality health care and wellbeing programmes for Aboriginal and Torres Strait Islander people. 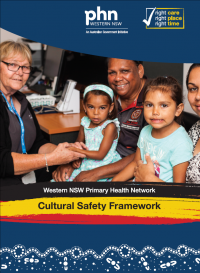 WNSW PHN’s Aboriginal Health Council has played a key role in the preparation of the Cultural Safety Framework. Embedding a cultural safety process in WNSW PHN’s commissioning of health services plays an important role in Closing the Gap between the health outcomes for Aboriginal and Non-Aboriginal People in Western NSW. We acknowledge that we work on the traditional lands of many Aboriginal clans, tribes and nations. We commit to working in collaboration with our region’s Aboriginal communities and peoples to improve their health, emotional and social well-being in the spirit of partnership. DISCLAIMER: While the Australian Government Department of Health has contributed to the funding of this website, the information on this website does not necessarily reflect the views of the Australian Government and is not advice that is provided, or information that is endorsed, by the Australian Government. The Australian Government is not responsible in negligence or otherwise for any injury, loss or damage however arising from the use of or reliance on the information provided on this website.